GivingPress is excited to announce the release of the free WordPress nonprofit theme, GivingPress Lite. GivingPress is passionate about improving the appearance and functionality of nonprofit websites. 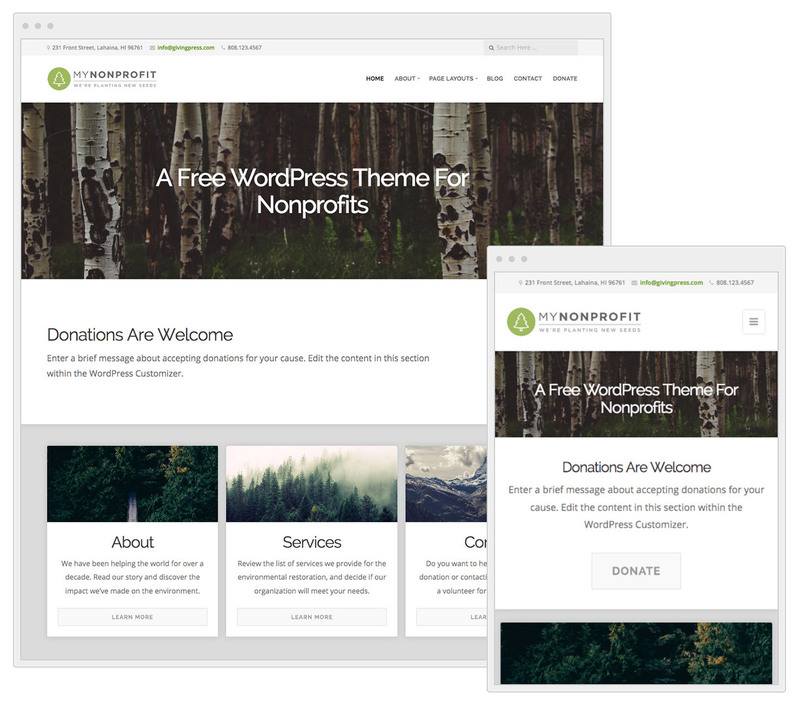 The Lite version of our GivingPress WordPress theme is freely available for any nonprofit organization with web hosting and WordPress. The theme features a fully responsive framework that molds perfectly to any mobile device. That means more donors can access your site more easily. The design is professional and modern, giving your nonprofit website the updated appearance it needs. The donation section can be easily customized within the WordPress customizer by navigating to Appearance > Customize within the WordPress admin. Link the “Donate” button to another page or your external donation service, such as PayPal. In addition, you can easily upload a logo, manage custom menus, add a header image, change the background color, contact information and much more within the WordPress customizer. Setup your website with the GivingPress Lite theme in a matter of minutes! GivingPress Lite is a simplified version of our GivingPress Pro theme, provided to all GivingPress members and available for purchase on our site. The pro version features a ton of extra customization options, page templates and functionality. GivingPress Lite is available for download on our site, or within the WordPress theme directory. Having the theme in the directory ensures that it meets the highest WordPress standards of code and security. In addition, your installed GivingPress Lite theme will receive continual updates. Get your nonprofit website started with the GivingPress Lite theme!